The Taborspace office receives dozens of event requests every day. Managing a 51 week calendar, with 13 spaces, in a beautiful and quirky historic building, and working with an incredible array of guests and events is a complicated task. Thanks to obsessive attention to detail and our wonderful scheduling program, Event Temple, we’ve been able to see the Taborspace community grow and thrive! Each and every event is manually entered to help reduce the chances of double bookings. As our building fills up, so does our calendar! Our growth has required our structure and policies to evolve and adapt to keep up with the amount of people and organizations that Taborspace resources. Our contracts are designed to help thoroughly and clearly communicate expectations, general information, and policies so that each event is given the best potential to be as smooth as manageably possible! Please, read and review our contracts closely, and let us know if you have any questions. For a 95% refund, cancellation must be made 30 days prior to the reserved date. We keep 5% to cover our labor costs and bank processing fees. - A credit of 50% will be applied to events postponing with a notification of 7-13 days in advance of the reserved date. If a cancellation is given within a week, there will be no refund. 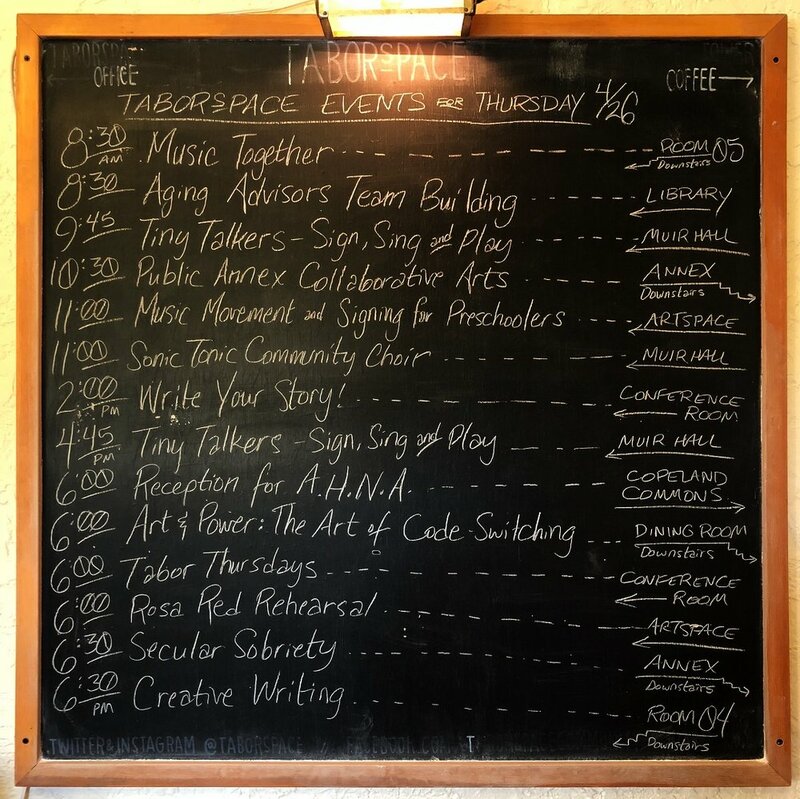 Taborspace has a community of roughly 70 monthly, bi-monthly, and weekly recurring events! Over 30 of those are support and recovery meetings, more than 20 are children and family events, and many others are various events that provide a unique service to our city. We are deeply grateful for this network of remarkable, caring, and active community members. It is an amazing organization to manage. Our staff does such an incredible job at it that most folks aren’t even aware of just how complex and busy it is; for instance, we host an average total of 120 events every week! If you’ve been a part of a recurring event or are just now joining, we’ve put this page together to help communicate context, clarify procedure, and celebrate the accomplishments of our community! Please take a few minutes to review the process and ensure your events go as smoothly as possible. Here’s the view of one week in just half of our spaces! On the 20th of each month, invoices are sent to Event Leaders for the approaching month and due on the 1st. Payments are only received via mail, online, or in-person. As of 2019, invoices are lumped together quarterly (January-March, April-June, July-September, October-December), to help consolidate and simplify records and information. The scheduling details for invoices are located in the bottom Notes section of your invoice.